Trace the evolution of Under Milk Wood in Dylan’s writing through the years, starting from when he was just 17. The opening of Under Milk Wood draws you into Thomas’ story of a day in the life of the inhabitants of the small Welsh seaside village of Llareggub (read it backwards). This “play for voices” is populated by some of the best-loved characters in literature, from blind Captain Cat to Polly Garter, Reverend Eli Jenkins to No Good Boyo. Lyrically written, it’s both riotously funny and deeply moving, and although firmly rooted in place, the universality of the characters shines through, which is why it’s never been out of print, it’s been translated into around thirty different languages and is regularly performed all over the world. Richard Burton, Peter O’Toole, Elizabeth Taylor, Sir Anthony Hopkins, Tom Jones, Philip Madoc and Matthew Rhys have all starred in radio, stage or film adaptations. As Dylan said to his New York cast before the first ever stage production: “love the words”. Is nothing in this place ever right? No dear. I hope you remembered to change your underclothing. I did. And to air my shirt. And do my teeth. And wash behind my ears. Dylan Thomas is living in Swansea. He discusses with his friend Bert Trick the idea of writing a play about a small Welsh seaside town. The name ‘Llareggub’ first used, in the early stories ‘The Orchards’, ‘The Holy Six’ and ‘The Burning Baby’. And Mrs Tiny Evans has been dead for many a year. Quite Early One Morning also has a character called Mrs Ogmore Pritchard with her famous line “And before you let the sun in, mind he wipes his shoes”. Thomas broadcasts ‘The Londoner’, the story of 24 hours in the life of a post-war London family. The dialogue and competing voices are comparable to those employed in Under Milk Wood, and the script also has a narrator holding it all together. The Voice of an Expert performs a similar role to the Voice of the Guide Book in Under Milk Wood, and the dialogue between three shoppers waiting in the queue for rations is like that of the neighbours discussing Mr Waldo. ‘Return Journey’ is written. This powerful and moving radio play charts Thomas’ journey through his blitzed Swansea and is another example of him honing his technique before the completion of Under Milk Wood. Thomas reads a part of the play at the Institute of Contemporary Arts, London. This was not recorded. Thomas gives a solo reading of some of Under Milk Wood at the Poet’s Theatre, Cambridge, Massachusetts. This was not recorded. The completed script of Under Milk Wood delivered to the BBC’s Douglas Cleverdon and copies made. The original was returned to Thomas, who lost it over the weekend and, before departing for America, told Cleverdon he could keep the original if he found it. A few days later Cleverdon tracked it down to a Soho pub. Under Milk Wood published in book form. 13,000 copies are sold in the first month, 53,000 in the first year, and by 1956-57 it had generated an income of £16,043. Douglas Cleverdon sells his manuscript of Under Milk Wood to the Times Book Company for £2,000. It is said to have later changed hands for five times as much. First annual Dylan Thomas Festival held at the Dylan Thomas Centre, Swansea. New BBC recording retaining the voice of Burton but with a new cast. 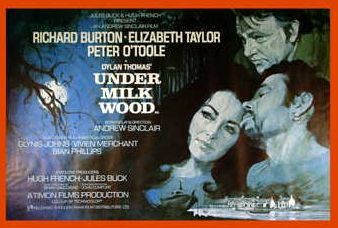 Fiftieth anniversary of the publication of Under Milk Wood, which has never been out of print. It is estimated that Under Milk Wood has been translated into at least 30 languages to date.